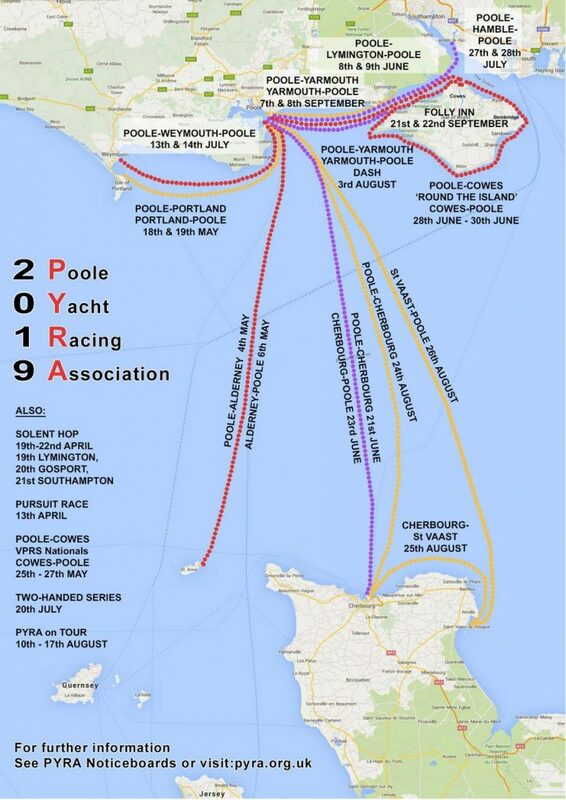 Poole Yacht Racing Association (PYRA) offers coastal and cross channel racing to yachts and multihulls based in or near to Poole Harbour. We usually enjoy some sociable chatter and beverages at the destination Rendez-vous. We put on a varied programme of races see sailing program and social events. PYRA is about having fun and enjoying our sailing. The precise split between classes 1, 2 and 3 is not decided until early April each season. Class 4 Ideal for couples, shorthanded or newcomers – Straightforward Bay, Coastal and Channel racing in company – very good company! Annual membership from as little as £55 with a free VPRS Rating Certificate for monohulls, or £40.00 for multihulls. For more information see about us/FAQ . To contact PYRA please go to Contact Us . Other points of contact are listed under about us/officers. Email Webmaster@ plus domain name.